Never before in the history of mankind have there been so many weapons in circulation. Automatic rifles, revolvers, machine guns, grenade launchers and so on. 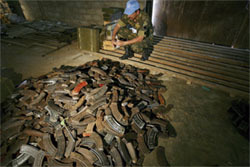 In all, nearly 500 million small arms and light weapons (SALW) are scattered in all four corners of the planet. There are some 100 million in Africa alone. The consequences are well-known. Some 90% of the victims of war, women and children for the most part, were killed by small arms fire. 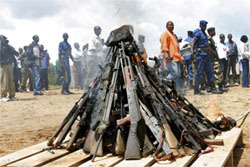 The over-supply of small arms has always had a negative impact on development, encouraging ever more violent crime and often connected with drug trafficking. Stemming the flow of SALW and destroying illicit stocks are genuine challenges for the international community. Several initiatives are currently under way to tackle the proliferation of small arms, run by the United Nations, the European Union and several regions of Africa. GRIP is closely connected with most of these initiatives. Whether in New York, Brussels or in the heart of Africa, GRIP’s SALW expertise is widely recognised and highly regarded. Peacekeeping operations multiply and evolve, and weapon transfers towards these missions rarely raise questions. This article develops the conditions necessary for such transfers and their implications. Even though they always appear as transfers to peacekeeping operations, they are above all transfers to the troop contributing countries, which assign them to their regiments deployed in an international operation. Within these missions, with losses, corruption and traffic, the opportunities for diverting the weapon are numerous. We should also not overlook the risks that appear after the end of the mission, when the soldiers go home, armed but sometimes aimless. A few states, however, oppose the inclusion of ammunition in the ATT and argue that controlling international ammunition transfers would be unfeasible and highly cost-intensive. This report discusses the challenges of ammunition controls in Africa against the background of the international discussions on the ATT. It demonstrates that concerns regarding ammunition-inclusion in the ATT are unfounded. It also argues that complementary action will be required by African stakeholders and their international partners to strengthen ammunition controls in the region.